On Saturday it looked like the Millersburg truck stop is still some time away from being ready. 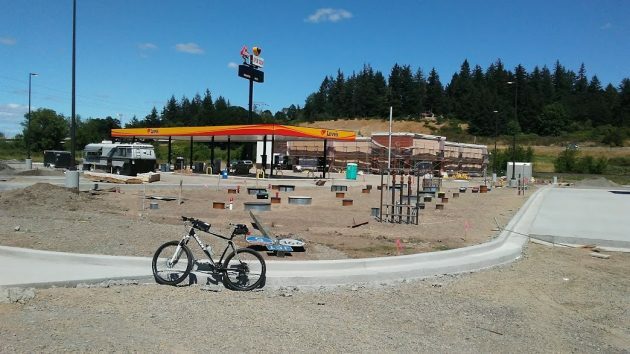 Wondering how things were coming along at the new Love’s Travel Stop and Country Store, I took a ride out to Millersburg on Saturday. When I checked in April, a worker told me the place would be ready on July 11. Someone with apparent inside knowledge commented that that’s the day the general contractor was to turn the place over to the owners, and a grand opening was planned for July 25. Those dates now appear to be optimistic, judging from the looks of the site. The main building still has scaffolding on the outside. The fuel stations remain to be installed. And the huge surface has yet to be paved. I’ve inquired with Love’s headquarters in Oklahoma City but haven’t heard back. My previous commenter told me the opening will be later but didn’t give a date. 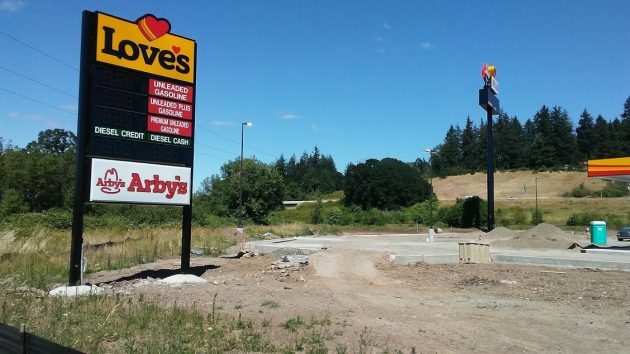 The signs are up, including a tall one visible from the freeway in the background. Nah, unfortunately at the moment it is actually the original slogan. From a Corporate Contact: Opening for customers in mid to late August. Darn….missed the free hotdogs today !